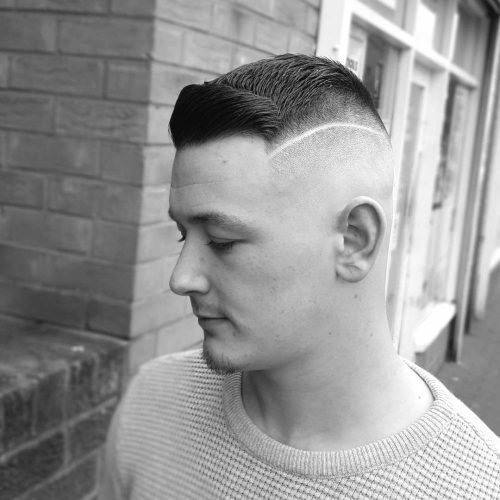 The crew cut is a classic and clean and sharp look that stands the test of time. It gets its name from university Ivy League crew (rowing teams), as a way for guys to keep their hair short and out of their eyes while rowing. Originally, it used to be more known as the short pompadour. 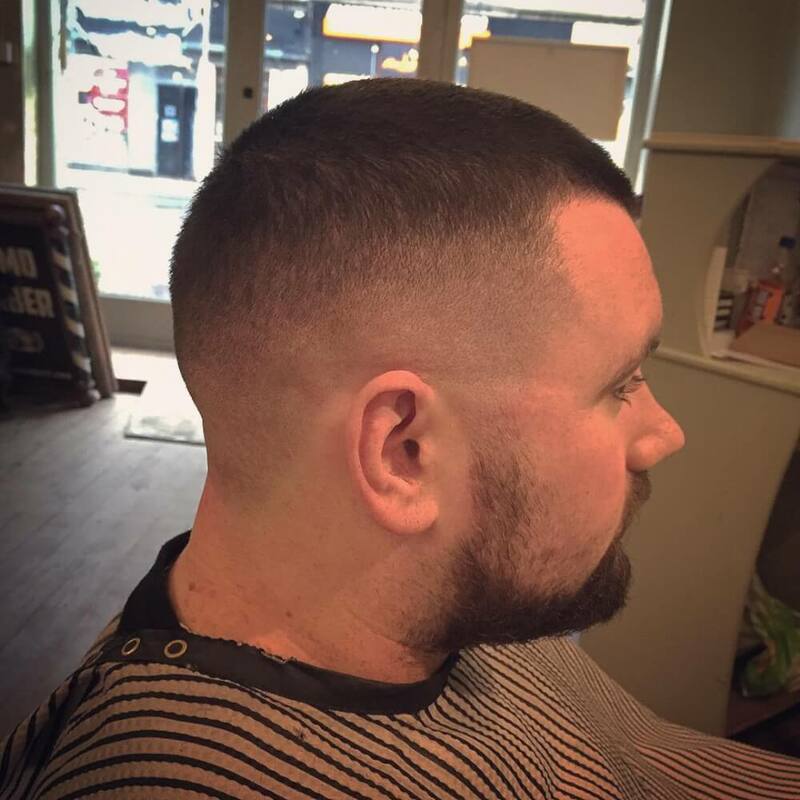 It’s also sometimes referred to as a butch cut, but the difference between the two is that a butch is very short and all one length at the top. 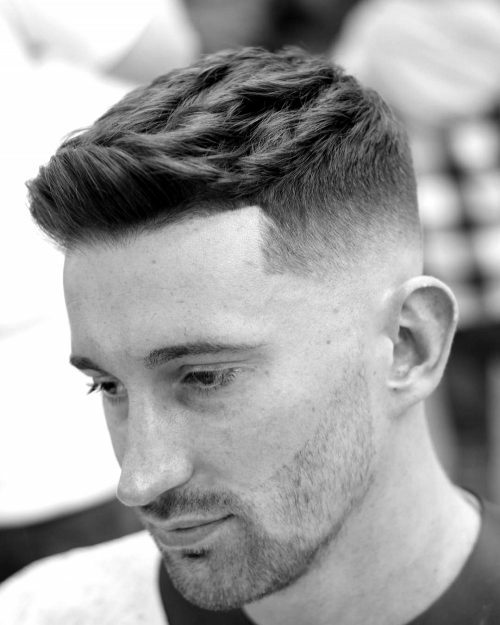 Scroll below to see some inspiration and great examples of this simple cut. 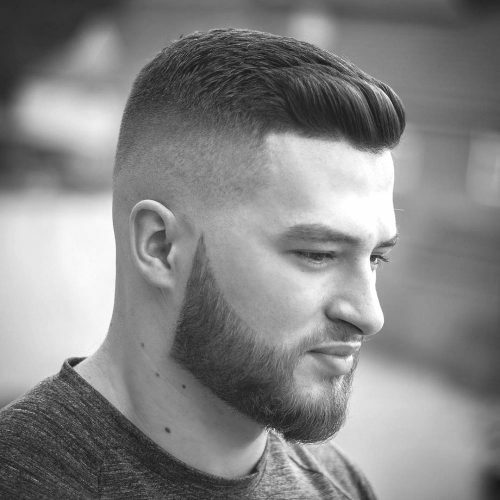 The men’s crew cut is short around the sides and back and faded or tapered into a longer length on top, but not quite as short as a buzz cut. It’s most common to brush the hair on the top forward, while the bangs either go straight up, up and back or parted to the side, depending on how long it is on top. 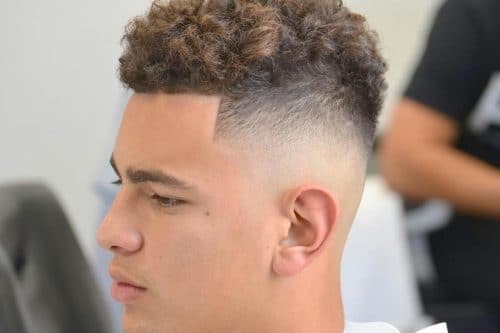 The sides and back are evenly buzzed or shorter, typically faded using taper fade or shorter faded clippers down anywhere between a skin fade to a clipper sizes from 1 to 4, depending on the look you’re going for. The neckline is great to taper off, for an even cleaner and modern look. For an even cleaner look, keep your face shaved and short sideburns. For a more casual crew cut, go with a longer length on top and keep it more tousled. Just note that the shorter the look, the easier it is to style, but does require more frequent cuts to maintain the look. Simply asking for a crew cut will do the trick. Let them know if you’re willing to style it or not, as this will affect the length of the top. Request your fade type. 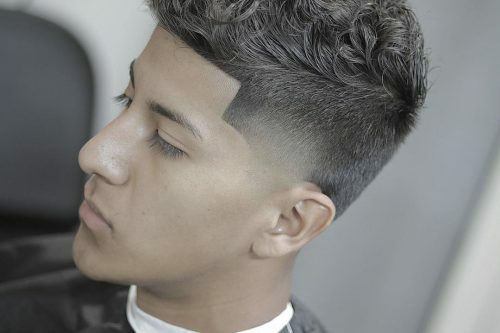 This can range from a simple taper fade with scissors all the way to a skin fade with clippers. Depending upon your hair length on the top, you may not have to style it at all. The longer it is on top, the more you’ll want to style it. If you want a brush-up, short pomp look, then you’ll want to use a hair product like a wax or pomade. You may need to use a comb and blow dryer to force your hair to either go up and or go up and to the side for a younger look. 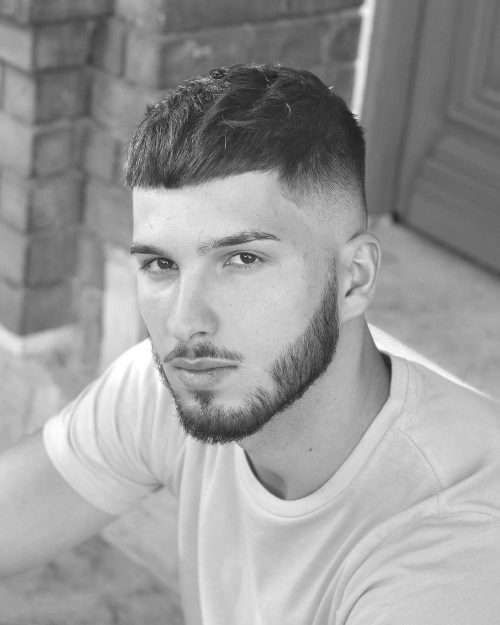 Crew cuts are a great choice for men of any age, especially professionals or those who have a more active lifestyle and don’t want their hair getting in the way. This cut also works well with sideburns, very short beards and long beards. The crew cut tends to work best for guys with thicker hair. 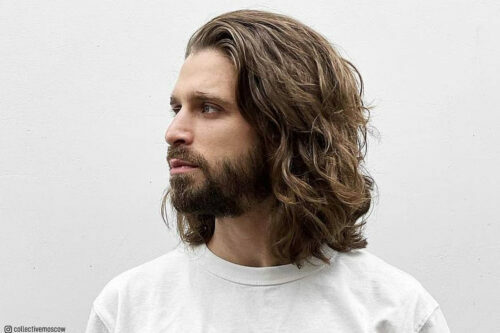 Guys with thinner hair can pull it off at the right length. This can also work well if you have a receding hairline or want to go for a more mature look. Talk to your barber and get their input. The best thing about the crew cut is that it compliments most head and face shapes, which is one of the reasons why it’s a popular look. This one is technically more of a French crop, which is becoming more popular. The texture on top, combined with the straight, forward facing bangs really give this a clean and easy to style look. 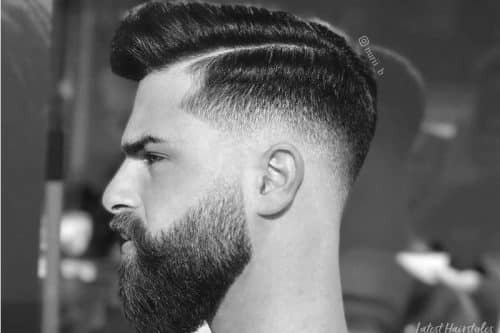 A mirrored look, combining the presence of the beard with a fade in between. It’s sharp, it’s clean and easy to maintain. Medium length hair with a slight pull-back, your day to day look will always be on point. 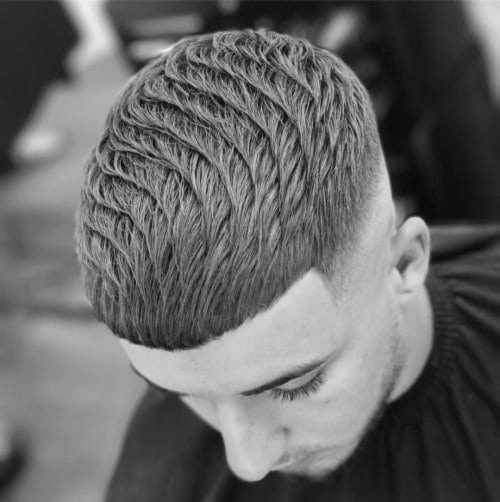 Like the famous Japanese paintings of waves, this haircut keeps everything low and trimmed to direct attention to the front side where a gush of hair goes across. Another fade cut, but more on the casual side, with a natural look for the top portion and medium to short hair to match. Well balanced. You can jog or do business, and it will still be easy to maintain. A haircut everyone will understand comes from the hands of a professional. There is no way you could have done this yourself, this cut is CRAFTED! You get this to impress, you get this to stand out and be the topic of remarks. A simple yet effective surgical line paired with faded sides does great in getting the attention to your top hair. It allows you to style your hair any way you want and still look dope as always. Cool brushed up styles are tousled yet relaxed for a voluminous effect that is easy to style. Looks good on anyone who have short to medium hair. This crew cut is clean and versatile. My favorite thing about it is that depending on how you’re feeling that day, this can be styled to a person’s liking. It can be styled over to either side, or up in the middle making it easy and looking good. For products, I used Hudson and Hammers Alchemy which is a mix between pomade and wax that creates a satin shine Any pomade with a sheen will do. This looks caters to the modern man looking for something clean and easy to style. Whether you’re looking for men’s or boys haircuts, this classic look suits all! I would describe this haircut as a clean and polished crew cut. My favorite thing about it is how precise and sharp it is, as well as how it showcases a person’s facial features. It is a no fuss look that still makes a statement. Speaking of “no fuss”, this hairstyle only needs one product to make it look polished and done. I use Kevin Murphy Easy Rider on most of my short men’s cuts. It is smoothing and dries with a natural finish. 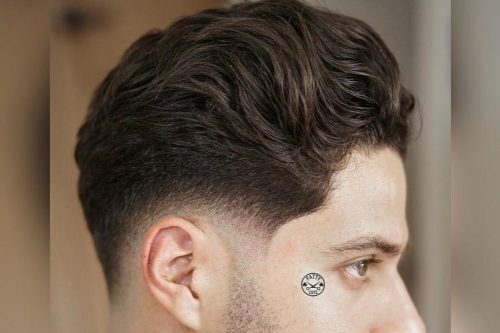 Any hair creams would go a long way in this cut. It can be very kempt, or roughed up and tousled for a casual day. Dare I say this gentleman loves this cut because it does NOT require product for the days he does not feel like styling. I would recommend this cut to a variety of men. 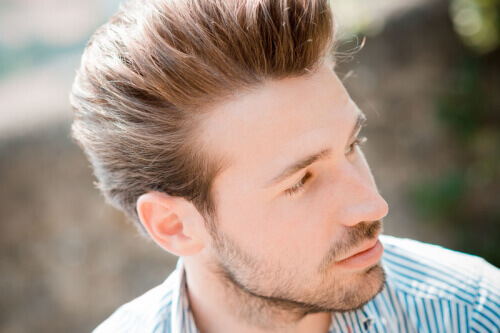 If a client is a little on the thinning side, it can really help a man’s hair look thicker. If he does manual labor or plays sports, it is a haircut that breathes and doesn’t trap sweat and heat. As far as face shape goes, I think it can complement the ever-graceful and perfect oval shaped face, but it can also help thin out a more rounded face shape. The beauty of this haircut is that you can modify it. 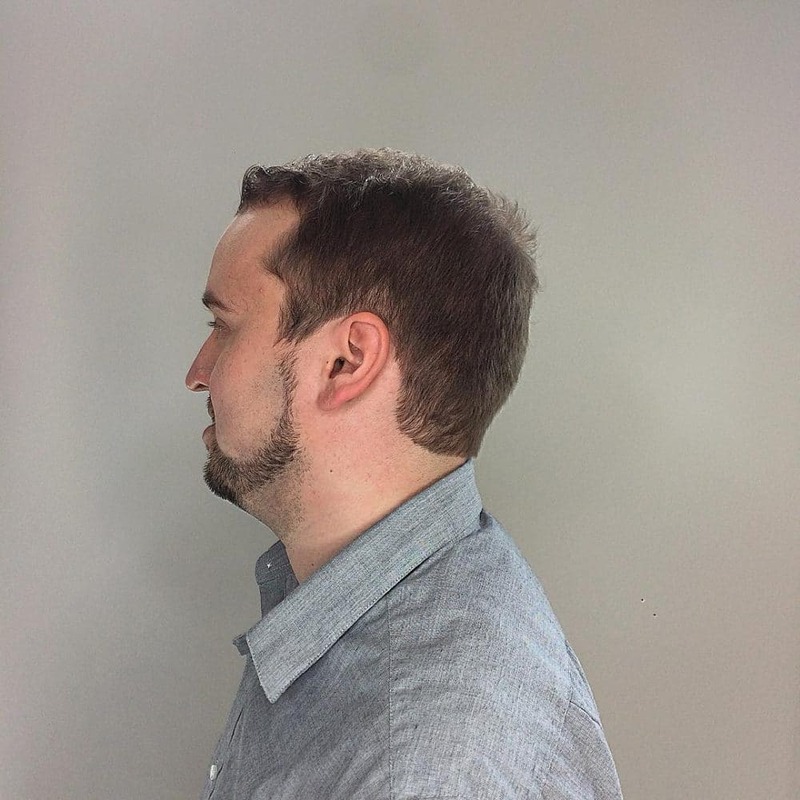 If someone has a long chin, for example, you can leave a little more length on top for balance. If their face is triangular, leave a little more around the ears to fill out and match their jawline. 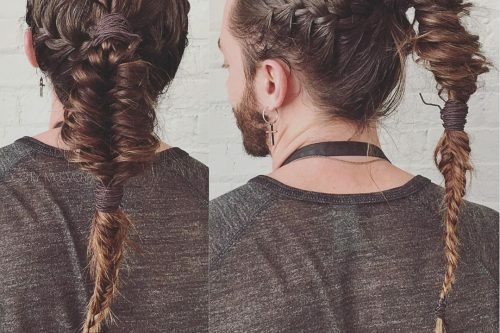 My model Kyle had been rocking that undercut/man bun we’ve been seeing since about 2015. He revamped his entire style by getting a crew cut and came out looking and feeling professional and confident. This is a classic crew cut. My favorite thing about it is about manageable it is and that you can go anywhere with it. 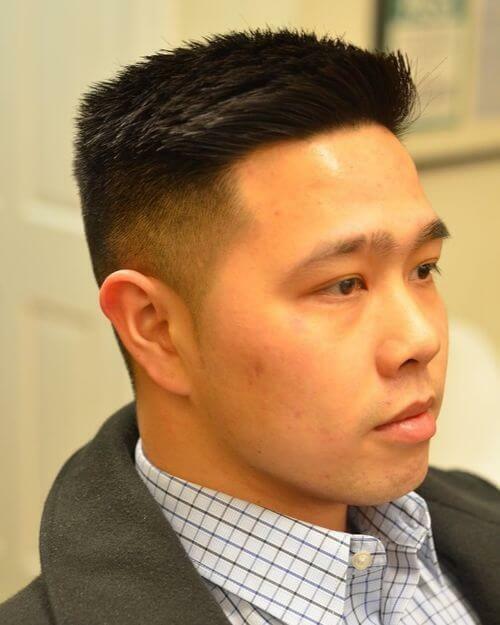 This cut is perfect for a professional businessman that’s love to be casual as well as professional. I recommend Esquire Shampoo, Conditioner and Clay (medium hold with a matte finish). 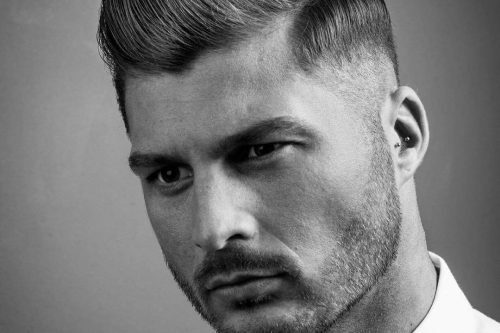 The crew cut is a classic and a timeless hairstyle. It’s like looking at watches. When you find a nice piece, like a Rolex, it will never get old. With the touch of a fade and the client’s opinion on how they want to line their sideburns (i.e. 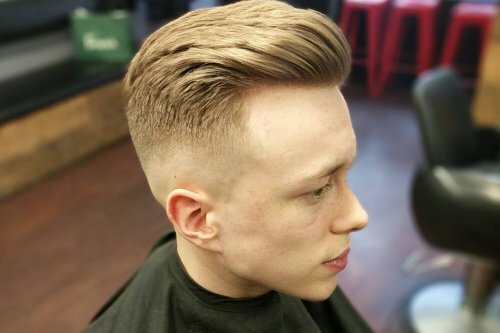 pointed, square or tapered), the haircut will still stand out as the classic look. This kind of haircut would be suitable for nearly everyone. I feel this haircut is suitable for most guys since it compliments most head shapes. The styling also depends on how their hair grows. The direction of the hair will be the judge on which side it would be best combed towards. This hairstyle is also quite versatile. 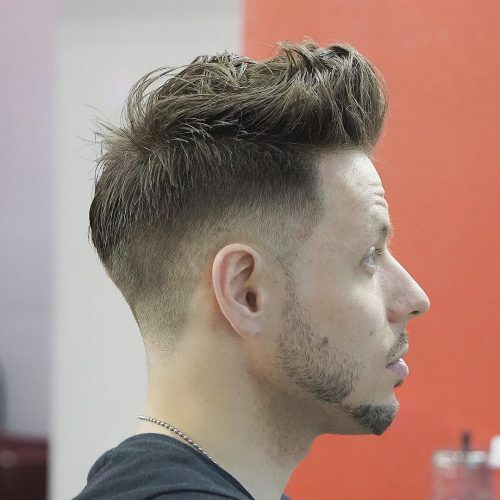 If the barber or stylist decides to leave more length on the front, the client would be able to pull that part up as they style to give them a pompadour look. This hairstyle is pretty universal in terms of the client. Whether the client decides to wear their hair messy or neat, this hairstyle would still look great. 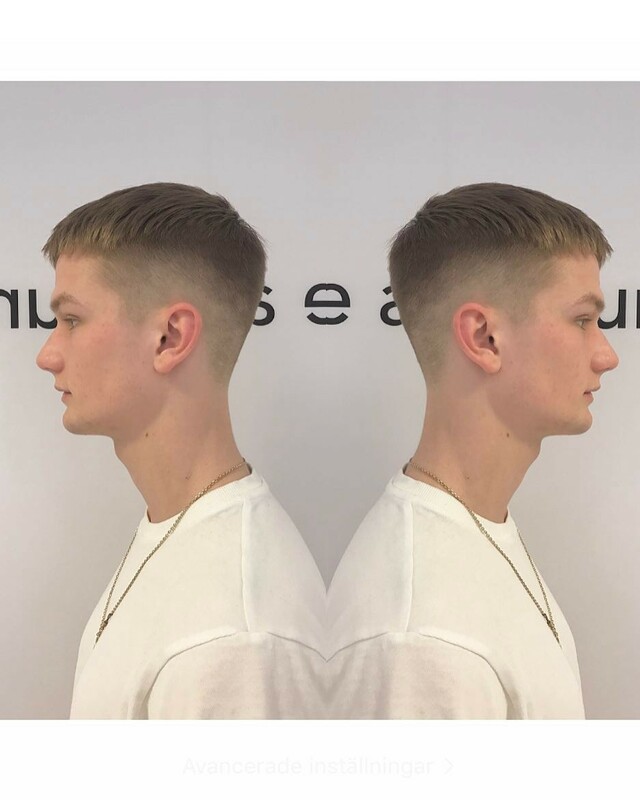 The crew cut is a great hairstyle for casual days or evenings, with little to no products required and a neat and tidy finish for a classic look. The products I recommend for this hairstyle would be something simple and dependent on what and how the client would want their hair to look and stay together throughout their day. For this specific look, I would use a pomade for more sheen, and for more of a matte look, I would use clay. Fortunately, there are many products on the market that are water-soluble, making it easy to wash off and suitable for everyday and special occasion use. The crew cut is characterized by short back and sides and hair length on top that is about one or two inches. The longest hair generally begins at the front hairline and gradually shortens toward the crown area. The back and sides can be as short as skin. 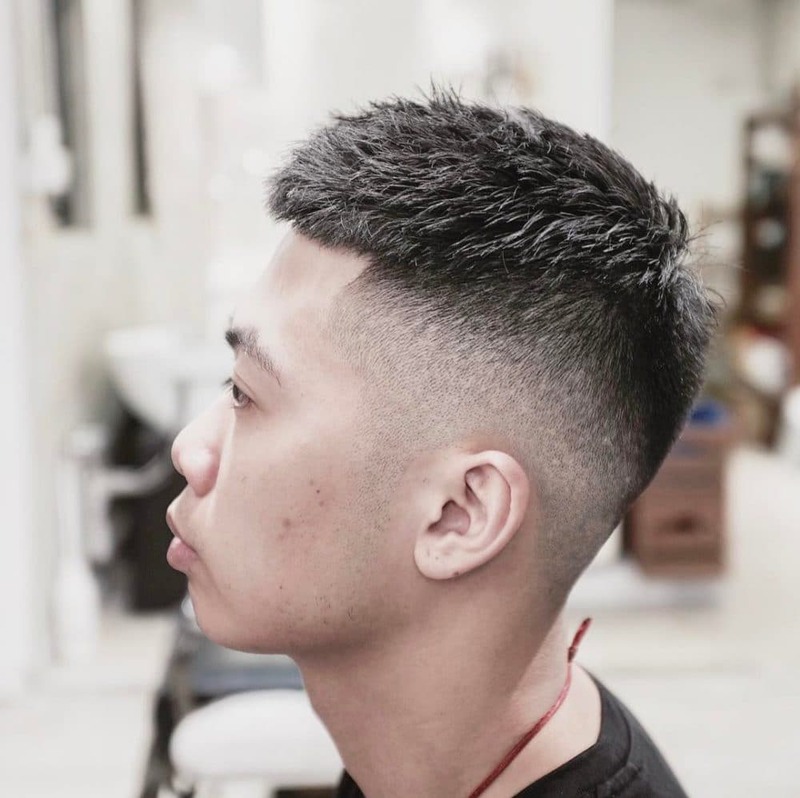 Whichever length is desired, the back and sides will be tapered to connect with the hair length cut on the top of the head. In the crown area, the hair will be cut very short, so short as to eliminate the issue of having spiky hairs in the in “whorl” area of the back of the head that just won’t lay down. 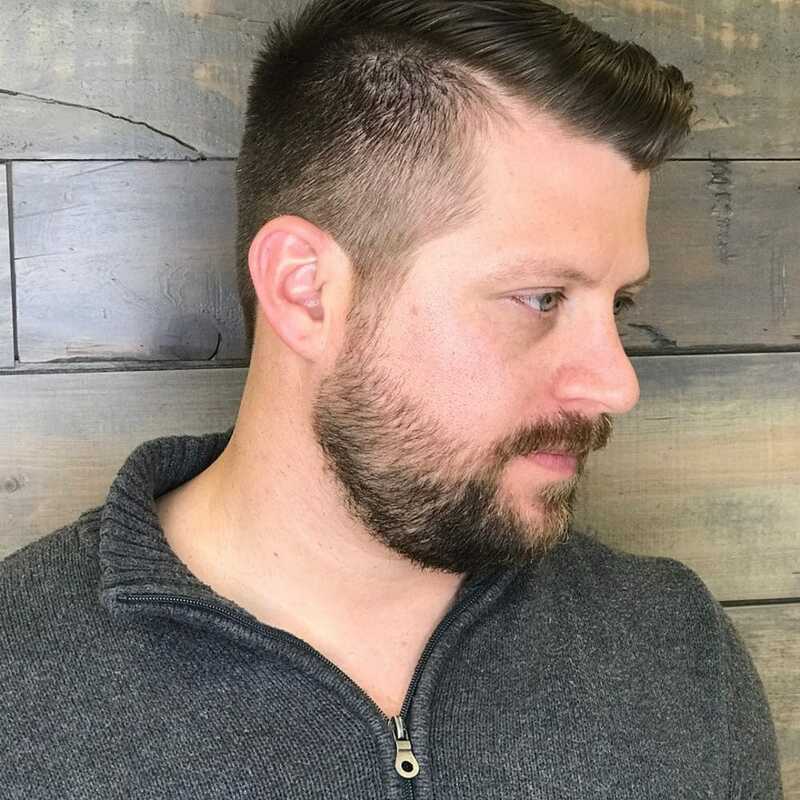 As a barber, my favorite thing about this look is the fact that it does three things very well: it grows out beautifully, it is easy to style, and it is both athletic and professional. 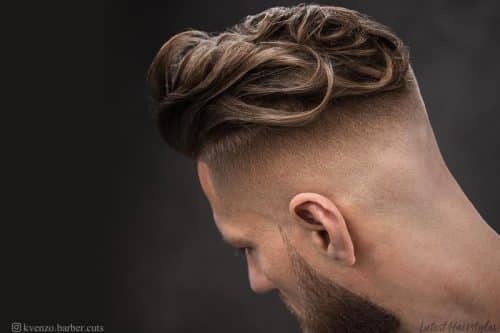 I recommend this haircut for any individual who wants a low maintenance hairstyle and/or holds a vocation or position that may require certain hair length regulations (i.e. police officers, athletes, military personnel, etc.). 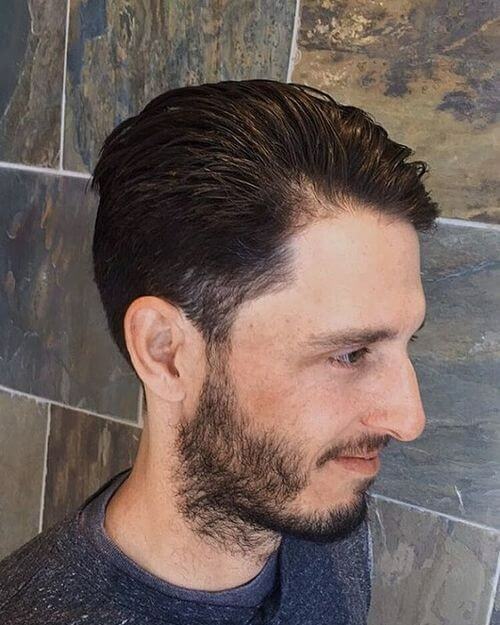 I even recommend this cut for individuals who hold what some call “white collar” jobs, because when styled properly, this look simply exudes confidence. This haircut can be designed to look good on nearly any face shape. For instance, the cut can be fitted nicely for someone with a round face shape by maintaining squareness in the area of the parietal ridge of the head (where the sides meet the top of the head). This will make the face appear more oval in shape. 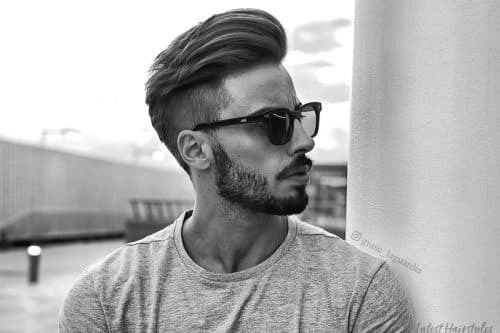 If the individual feels their face is too wide, the barber or stylist can lengthen the appearance of the face by leaving the hair longer on top so that the client may style their hair up and into a short pompadour, which always looks great. 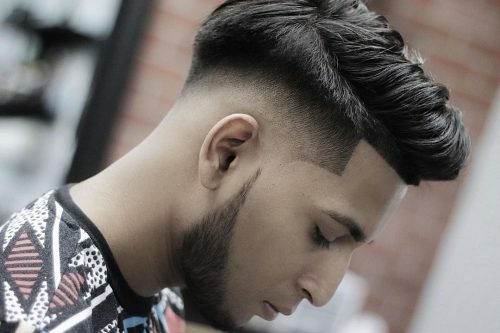 I would advise anyone who wants this look to ask their barber or stylist to design their crew cut so that is gives the most oval shape to the face as possible. 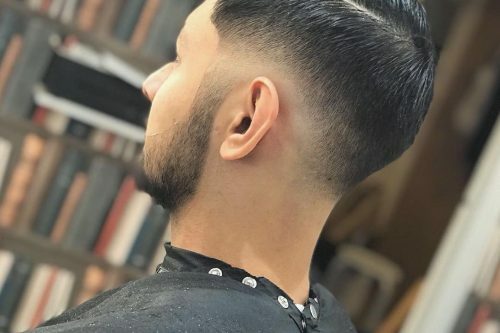 This is usually done by preserving length (or “squaring up”) where the sides of the head meet the top and by leaving the appropriate length on top. This look as seen on my patron in the photo was styled by working a small dab of 18.21 ManMade Paste (medium hold, satin sheen) through towel dried hair. Once I worked the pomade through the hair evenly, I combed it into shape by directing the hair forward and sideways from left to right while combing the hair on the front hairline back and up. The nice thing about styling a crew cut is that you can get great results with the number of different products. I would recommend a high hold pomade or a medium hold paste for the person who wants a dapper, more dressed up style. If one was going for a looser or messier look, I would recommend a clay applied to dry hair and roughed up a bit by hand. This is a great everyday look, the neat and long crew cut. I like it because it’s easy to style and looks fresh. This look is best for those who prefer a shorter haircut. It suits all hair types. I recommend a good matte pomade like Byrd Matte or Reuzel Clay pomade. Barber @ Primo Gentlemen Barber in Glasgow, U.K. This haircut is a crew cut as it’s taken in by a guard 3 all over, then faded down to the skin using foil shavers and a straight razor. My favorite thing about the cut would be that it’s a fun haircut to create and the fade is more gradual, making it look very clean. This classic crew cut is a look you’ll usually see on a man who doesn’t require too much attention on styling his hair on a day to day basis. 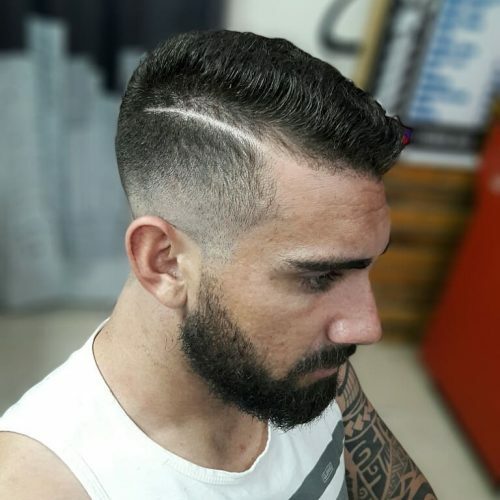 Men with thick and dark hair tend to go for this haircut, as well as men who work with hard hats or are required to wear a hat during working hours. For this specific hairstyle, there isn’t much product required. If you want the hair to have a little shine, I’d recommend using a pomade like Layrite or Dappa Dan pomade. I would describe this look to be a classic style for a well-kept man. My favorite thing about this look is its ability to adapt to many face shapes. It doesn’t hurt that it’s easy to wear too! This look is great on a structured face, but also a round face. Its versatility makes it appealing to any face shape out there. I recommend working in Redken’s Work Hard molding paste that is more of a matte paste and finishing it off with Redken’s Control Addict 28. I would describe this crew cut as a simple and safe traditional hairstyle for the summer that is super low maintenance. 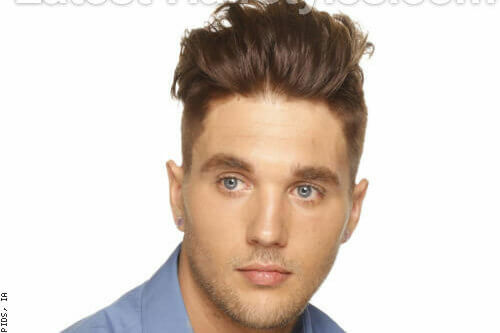 I recommend this haircut to someone who needs a more comfortable look for summer. It is perfect for someone who’s always on the go and doesn’t have time in the morning to do there hair, or get into a shop every four weeks for another cut. I used the Aveda Pure Formance liquid pomade to style this look. 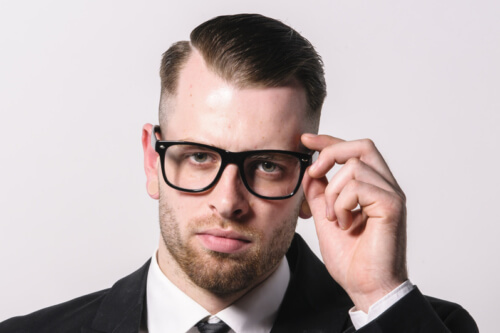 Together with the skin fade, this crew cut is classic and energetic at the same time. I like the texture of the evenly chopped layers on the top. The uniform layers give the top some movement and thickness that is very easy to manage. This guy is a policeman, he needs something clean and easy. 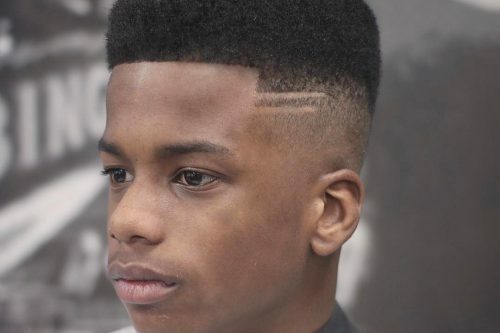 He has very thick hair, so this crew cut can soften and lighten his top while still appearing thick to show the fade well. For clients with a receding hairline and thin hair, this artificial horizontal fringe can actually cover the receding hairline very well. 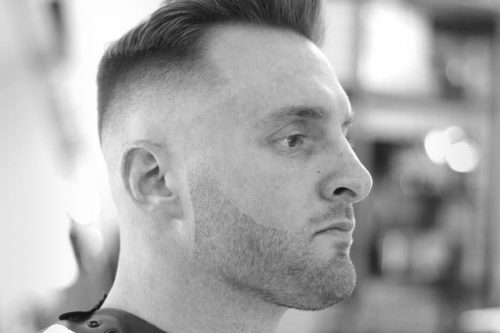 The barber just needs to be aware of the part that needs to be kept to form the thickness covering the receding part. Many face shapes can suit this cut as long as we control the height of the conjunction well. For example, a rounder face would look good with a mid to high fade, while a thin long face would look good with an even lower mid-fade. 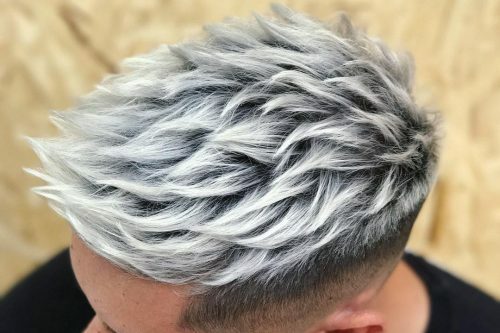 I recommend using a matte pomade/wax to recreate the choppy texture. 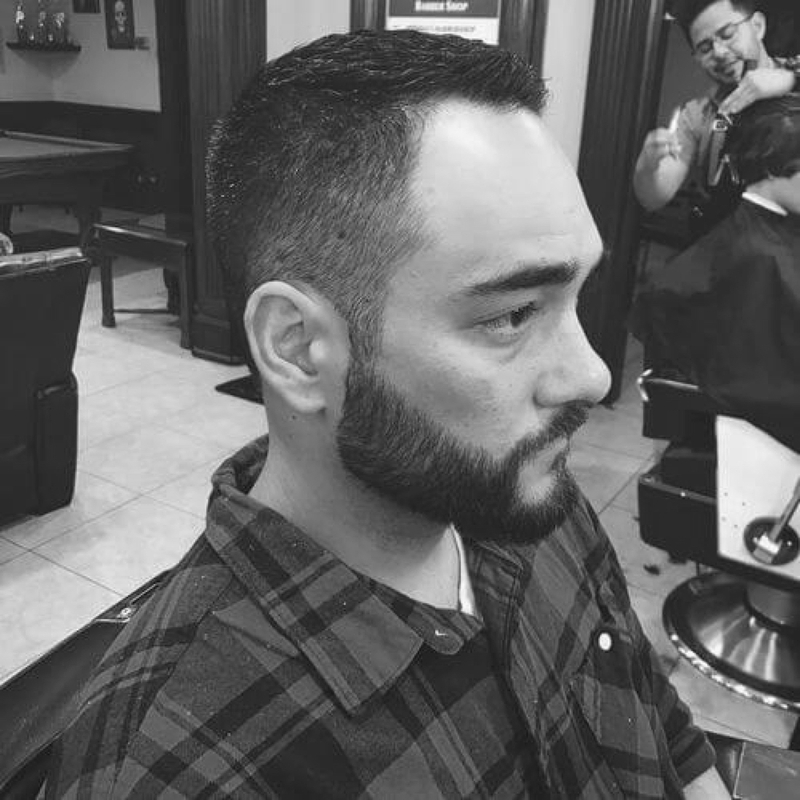 I used Uppercut Matte Pomade for this crew cut. Personally, I love this crew cut look because it’s clean and messy at the same time. I always do this kind of haircut with scissors (scissor over comb). It’s a haircut with attitude, so it fits a person who suits that. In this client’s case, it suits him because he is really interested in fashion, has some tattoos and loves to skate. I work with Bumble and bumble, so with this specific haircut I used the Styling Creme in damp hair, then finished with Sumo Clay for extra texture. This look suits someone who has a lot of hair that is not necessarily “thick” so you can create the messy texture in the crown area. 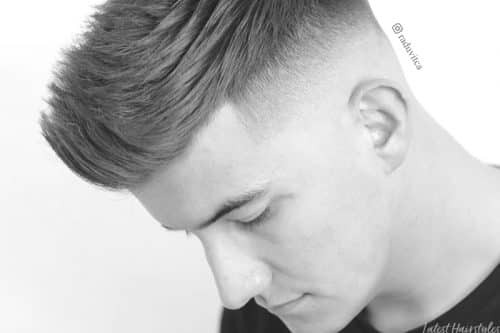 The client who gets this kind of haircut needs a good shape of the neck/head.